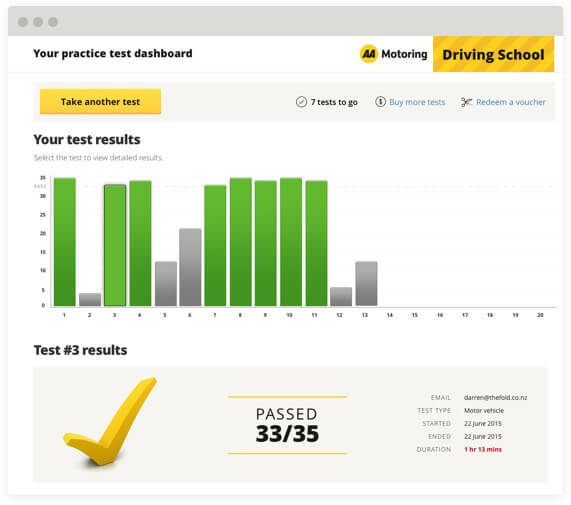 Log in below to access your practice test dashboard. Purchase for yourself, or as a gift voucher for someone else. We'll tell you how long it took to complete the test so you can see if you'll be fast enough for test day. PLEASE NOTE: ROAD CODE PRACTICE TESTS ARE AVAILABLE IN ENGLISH ONLY. Disclaimer: Questions and answers are based on The Official New Zealand Road Code. 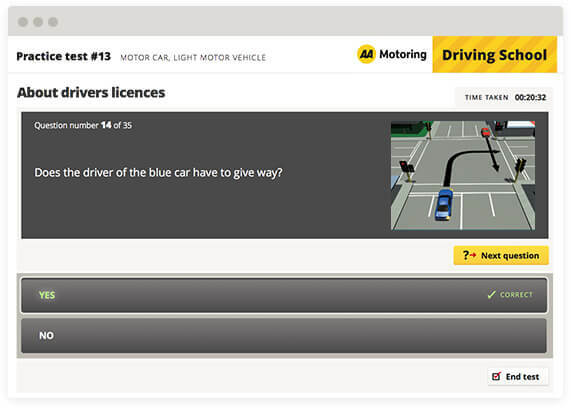 Images, questions and/or answer text in AA Road Code Practice Tests may differ from the actual learner licence theory test. An AA Road Code Practice Test is not an official practice test. The New Zealand Transport Agency does not endorse or approve the test and does not attest to the validity of the questions, answers or other information included in the test.